England during my summer off that have caught my eye. The places are all around the Dorset, Avon, Wiltshire, Somerset and Hampshire areas and are all within a day trip from my home in Salisbury. Some of the places I have already visited, some I visit often and love, others I will be visiting for the first time. I will be taking photos, possibly doing some sketching and hopefully writing a blog post to give you a flavour of the places and the pros and cons of visiting them. The red markers are places I’ve visited before and can highly recommend, but have yet to write an article about. 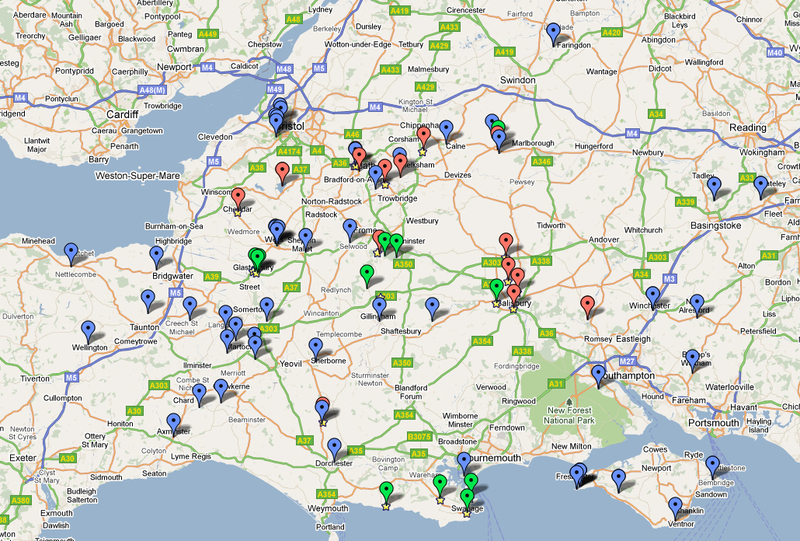 The green markers are places that I’ve visited and written a blog article about. The blue markers are places I’ve yet to visit. I’m looking forward to some great days out that will inspire me to take some great photos and write some interesting blog posts. Hopefully by the end of the summer most of the markers will have turned to green and I’ll be adding some new blue markers further a field! This entry was posted in My Blog, Wealie Nice Places to Visit and tagged blog, days out, photography, Places of Interest, ruth weal, South West Britain, South West England, travel, wealie. Bookmark the permalink.